Question 1: Would LIRR freights work eastbound making setouts and pickups and then work back westbound doing the same thing on the Montauk branch for example? Model railroaders always like to know this. Mark Smith: Most freights for the Island started out of Holban yard. Depending on where they were going some entered the Montauk Branch at St. Albans. These would be the Montauk, Long beach , Patchogue and South Side extras. These are to the best of my memory. South Side Extras were run with DD1's. I know I worked once a locomotive that had an extra car behind with third rail pick-up shoes to help avoiding gaps while servicing sidings. These runs would turn at Babylon and return to Holban Yard on the same day. Holban yard had a few tracks electrified to allow electric operation. Just short lengths on either end. Enough to get on the train and leave the yard. On cutting off one day, they sent me down a track to go back to Morris Park. I saw the end of the third rail and stopped thinking they sent me down the wrong track. I had to be picked up by switcher and taken to the West End of the yard to be put on third rail for Morris Park. I learned that you were supposed to give a DD1 a shot of juice and coast thru the yard and pick up third rail at West End. Live and learn. Any freight East of Jamaica (Holban Yard ) was handled from Yard A and Fresh Pond by hauling jobs which also returned westbounds to Yard A and Fresh Pond. Greenport, Port Jefferson freights would turn on East end and run West the next day. As you had asked; they would work as you said basically picking up westbounds (in other words working sidings accordingly). In busy times, other extras would run on these lines such as: coal, potatoes, etc. However, coal for the State Hospitals was usually handled with the regular freight runs. Question 2:. How often would the large bunker at Oyster Bay and Islip receive coal loads, how many cars? Mark Smith: I could not be sure how many cars would be delivered at a time to Oyster Bay or Islip. I do not think it would be too many as they were handled in the local freights and to my knowledge never by extra trains. Question 3: Would a days run be from Hollis or LI City to Babylon, Islip, Patchogue, or? Question 5: Any ideas on what types of loads the local team tracks received? Mark Smith: I believe lumber, food and general merchandise. Coal also was unloaded to a conveyer which would extend up from below the car to empty into a truck. Question 6: Islip had Bayslip Plumbing and Patchogue Red Rose Plumbing and T&S Building Supply. How much freight would this generate in a year in boxcar loads? Mark Smith: Do not have a realistic answer for you on this. 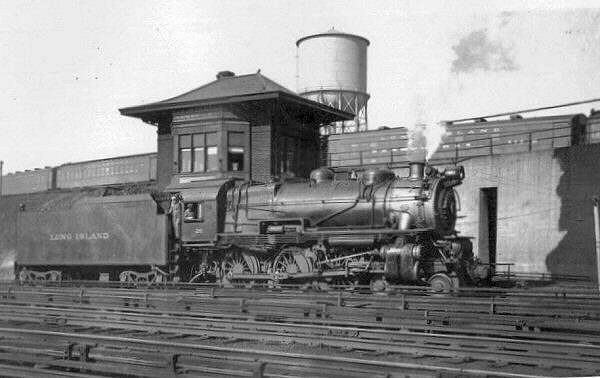 Question 7: The Patchogue engine house is gone by the 1920s. Why? Were engines stored off the turntable for the morning commute? Mark Smith: In my time engines were turned on turntable and laid up in sidings for morning runs. 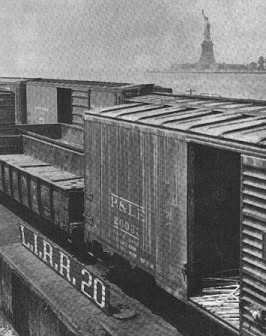 Question 8: What kind of freight traffic was handled in Patchogue in terms of numbers of trains per day/week? Mark Smith: In busy times I believe a job would be added to work PD, otherwise freight would be handled by Montauk jobs. Question 9: Any unusual freights you remember: ducks, potatoes, etc? Mark Smith: My first job with a major freight was in 1947, I believe. Had a new fireman, also at the time for a H-10 stoker fired locomotive . On arrival in Holban Yard asked how many cars we had. Answer 80. WHEW! Extra to Riverhead and Greenport for potato loading. We were already having a tough time as we left Holban Yard at Hollis on to the main. Had a good old time Conductor which was great help. Worked thru the night to Greenport and returned west after eight hours rest. This was a time when potatoes were a big thing for our railroad. One job was the Riverhead switcher that worked out of Greenport to Riverhead and returned setting cars for the extra freights. I worked this job for week on a hold down. Also, extra freights were called from Holban to Riverhead and returned daily during this period. Can hardly remember these times and amazed that it is all gone and has been for years. Another train I just thought of was called the BEEF. Cars arrived by float in Long Island City and were set off on the loop track for prompt dispatch to Flatbush Ave. meat sidings just off the station tracks underground, also a siding in Van yard up a ramp. I believe a lot of this was Kosher meat. Van yard was just East of Flatbush Ave station on the South Side. Van Tower controlled entrance to the yard. As far as I know it is still in use and on trains leaving Brooklyn you would see the opening out of the tunnel leading to the yard. This was a layup for Brooklyn trains during my time. One track in the yard, by making a reverse move, led up a ramp to a meat house siding which I believe was really on Atlantic Ave. Many times you laid a train up there or picked one up there. These were moves that had arbitrary payments to road men performing these moves. Many times this determined selection of jobs by senior men. Maybe an extra hour or more a day. All straight time. All this changed when we went on the eight hour day. This was better in the end. I don’t have the date but a number of years ago I was running train 204 to Greenport. This was when we still had mail, Railway Express and baggage handled on many trains. We pulled into Jamaica to load and on the platform was a small donkey, probably from Sears, Roebuck, headed for Farmingdale. Well he did not want to get into the express car because of the gap between the car and platform. After a few minutes delay we left. On arrival at Farmingdale and spotting the car at the high platform to unload him he would have nothing to do with that gap again. Last I saw of him he was on his back being dragged off the train. The following are three tales of my contacts with commuters involved in the “Engineer-for-a-Day” program. 1. While on a trip to Greenport in 1956, we had stopped at Mineola and at the station were told to move up just past the overhead bridge and stop. As we did, there was a camera man all set up to shoot a photo. At the same time, President Goodfellow of the L.I.R.R. and Julius D’Amato, at that time Democratic candidate for congressman from the Second District both climb up on the locomotive, an ALCO RS3 #1553. The photo was printed in the New York paper the next day. I guess this should have been taken on a westbound train, but the photo site was better on the south side. All this was out of the blue and a big surprise to the engine crew. This was the beginning of the “Engineer-for-a-Day” program. I think there were two reasons that it worked on our railroad: all the operations were in one state, and, of course, no steam! I couldn’t imagine this with steam. 2. While working a Port Jeff train, we picked up the “Engineer-for-a-Day” in Syosset. This was on a C-Liner. He was like a big kid, all excited and asked to blow the whistle just west of the station as he lived near enough so the family could see the train. He did. These commuters also got a hat and red bandanna. This program was supposed to have a Management person on the head end as the rider was not to talk to the engineer or motorman while he performed his duties. In this case we had a clerk from upstairs that probably knew as much about the operation as the rider, so, of course, you would end up telling him what was going on, which, to me, was fun also. Evidently they did not have enough Train Service management to cover all the engineer rides going on. We were running on the Main Line and picked up a rider from Bethpage along with an Assistant Road Foreman of Engines. This man saw that our speedometer showed a speed up to 100 MPH. All he wanted to know was how fast we went. I kept telling him we only went 65 as that was the limit. He would wait a few minutes and then was after me again about how fast we went. Same answer. He kept saying, “But the speedometer says 100 MPH.” Again, I told him our limit was 65. That was all he was interested in. When he got off, the Road Foreman said “You did a good job” as we both knew that 65 MPH was out the window when we could do it! As I was nearing promotion in 1947 I bid on the Greenport freight as Fireman so I could learn the road, East on Monday West on Tuesday plus the same for the rest of the week. What a week. The first day I told engineer I was not too familiar with the H-10 stoker. He said we would do OK. The first day was not too bad. The second day was a mess. Everything did not work to his satisfaction. We ended up outlawing at Ronkonkoma and deadheading to Morris Park in the hack. In the meantime it started to snow and he laid off so I stayed on the job, otherwise I was ready to lay off sick. Next day I had an extra man we had trouble but lived with it. The snow kept piling up and we were late by DUNTON on the way to Holban Yard to get our train. We went as far as Ronkonkoma and were told to return to Holban Yard. Then another change and we were told to proceed east to Greenport. The coal was like mud going into firebox. Believe it or not the side curtains were frozen to the cab and we had to chop ice off the steps to get in and out of the cab. THIS WAS ON LONG ISLAND! After one more round trip I was told I had to go up and take my tests for promotion. I was glad to get off that job! I then rode the rear of the regular trains to learn the road. Sometimes you got set back from engineer to fireman as a result of change in traffic, due to various events, such as the coal strike of 1950, which cut a number of jobs and took a while to overcome. Being set back was not all that bad, as you became senior on the fireman’s list and had the choice of good jobs. During this period of time I worked a Yaphank job which went something like this: You worked all week on the electric DD1s as a helper in and out of Penn Station. Nice and easy. On Sunday it caught up with you. You made a round trip from Jamaica to Port Jefferson and return with a hand-fired G5s, with just enough time to yard the train, return to Morris Park, change engines (luckily a stoker-fired K4s), pick up your train and head east to Upton Junction (Yaphank), lay up there for an hour or two and head west as train #4229. One day on this job I was running the train west and the extra engineer was firing, a practice we used a lot among the younger men. As we passed the distant signal for “B” tower, I called it “clear” as we could not see the home signal around the curve. Well, a westbound train on the Central Branch went past us on the line to our left, traveling so fast we thought he must have the signal. The engineer asked me if we had the signal. I said we did, but we slowed down as we thought maybe it was taken away from us. As we rounded the curve, the other train was sitting at the home signal and we had the main. We wondered how he got stopped. He really should have been run ahead of us as his next stop was Jamaica, and we had to make all the local stops. This was before we had traffic control in both directions on both tracks. He was fuming at us in Morris Park, but, of course, we had nothing to do with it. He told us we did not know how to run a train, amongst other things. 1. Sign in with the Engine dispatcher to get your locomotive number. (You already have a job number so he will tell you what engine you have. 2. Go to the track where the locomotive is ready. 3. Inspect the locomotive by a walk-around. 5. Try your brakes and check air pressure. try the stoker if installed. This also includes setting the jets over the plate where the coal falls and is blown into the fire. course, the shovel, hook and shaker bar. 8. The sanders may be checked also during this time. the engineer in the cab through three (3) indications such as would be picked up on the main. 10. When you pass “DUNTON” tower, you tell the Block Operator where you are going. All verbal at this point. out of New York (back in the days of engine change at Jamaica). get running orders. Regular trains were under manual block rules. permission of the Yardmaster or Block Operator. the yard. This is performed in advance by the yard crew. Diesel locomotives and electric would be the same as above, leaving out items #4, #6 and part of #7. In addition, you would need to check the oil in the crankcase on the diesels. Train heating boilers and water supply also are to be checked on the diesel locomotives as they operate this heating system. Our electrics did not have any train heat system. Heat from the steam engine cut-off was enough to get to New York and trains were heated in New York from a stationary steam plant and no heat was supplied until the engine was changed eastbound. We also carried two (2) sets of markers on the electrics as we shoved trains in and out of Penn Station. In 1945 when I came back from the army I worked this type of job (freight runs on the Montauk branch through Maspeth) to get back in the groove. I worked with an old timer who had a habit of falling asleep. As we came up to “Olivet” he put the train in the “Big Hole” and the first thing I thought we were ready to hit a Trolley car. Guess he just woke up and saw the stop signal and dumped it. At Olivet, eastbound is going up grade, a pretty good grade. Freights usually had a pusher behind out of Yard A. I worked the pusher as a fireman for a period. My engineer was Bill Cassidy. They called him “Hop-A-Long” because he did not work the locomotive hard enough to be of much help. We stalled on Mt. Olivet one cold night with the cold wind blowing into the cab. Bill said I guess the guy on the head end laid down on the job. He was trimmed by another old timer a day or so later. We discussed the job about not using the locomotive hard enough. His view was to give it all we had and get the job done, return light to Yard A and spot until the next shove in a nice warm cab. Yeah, right. Later when I was promoted to engineer I was called for the same pusher job off the extra list. Believe it or not I was more relaxed to be running a passenger job. So I thought, well, all I have to do is get behind the train and, when the brakes release, shove hard and get over the line to Fresh Pond and return light to Yard A.
I was fooled. They put me on the east end of the train (lead engine) and I had to figure out how to handle the air, etc. You could easily cause a problem with the brake, break in two, rough up the hack etc. Passenger air handling was easier as the train was more uniform. Anyway, the next thing was how do I handle this train over the cut-off thru Bliss, etc.? Work hard out of the yard, then have to slow thru Blissville and hit it hard again for Mt. Olivet? We were double headed with another pusher on the rear both with old-time engineers. All of a sudden it hit me. When we got the Highball to leave the yard I listened to the stack on the second locomotive and set my controls to meet his. I went out and all the way to Jamaica like I was an old-timer. I even got a toot from the old-timer on the second locomotive I passed going back to yard A. As to the air brake, I just put it in lap and we drifted to a stop. North Shore Yard (LI City Floats) Our coal was floated into Long Island City as was most of our interchange freight. A float of solid coal hoppers was handled with kid gloves. One side would be pulled half way off, then cut off the engine, go to the other side of the float, pull that track off, couple to center track, cut the engine off, return to first cut and pull it off, couple to the remaining cars and strip the float. At times the corner of the float would be under water during this move. The results of just coupling up and pulling a cut of cars right off the float could create a big problem. The float could just flip over, drop all remaining cars in the river, then flip back with all clear tracks. This was frowned on by the company. A large floating derrick would have to be hired to salvage what they could from the bottom of the river. Another problem could be hitting the bumping block on the end of a float. This did not always mean that the cars would go in the river at that point. If it was hit solid, the lines holding the float to the dock could snap allowing the float to move out into the river. Anything at the point where the lines snapped would drop into the river, again requiring a call for the large floating derrick. The Train Went: "In the Hole"
Another night, on a stone train to Calverton, while they were building the airport this happened. These trains were heavy and we used one unit so it was a grind. As it was during the late hours in the night it was hard to stay awake. We had just passed Pinelawn siding when, in the eighth notch the train went "in the hole" [train is in an emergency brake application], the idiot light came on, and as we were on full power we forged ahead and before you could think what happened you got a big hit in the rear which really woke you up. A carrier bar on the head car had fallen and, of course, this dropped the coupler and parted the air hose. As we were in full throttle the loco sped ahead, but the heavy train did not stop that fast. A rude awakening and delay setting out the cripple car. One of first jobs I was called for as a fireman was the "Scoot". Hand fired steam, three round trips Patchogue, PD to Babylon and return. As a new man I did not know what to expect as from the engineer. I was told his name was George Sutphin, I believe, so when I met him I used this name. He said; "Just call me: Micky Mouse (his nickname)". I could see it would be a good day and it was. There showed time in Babylon and PD between trains which I thought would give me time to eat. HA HA. Arrive Babylon : Go to yard to wye train in among MU's arriving and departing the yard and back in station in time to leave for PD. Arrive PD: Enter siding, run around train to turntable, turn locomotive, and take water back on train to head West. After about two round trips finally got a chance to eat pretty late at night. I never was furloughed, but during the coal strike in the fifties, when about fifty trains were taken off, I dropped back firing, but of course with enough time in to hold a decent job. One job I held was the Montauk round trip from Jamaica, two days pay plus some over miles and switching time. You worked six days on and off three to meet the mileage agreements at that time. All old time engineers and conductors. We worked it this way, the engineer ran it East and I would take over in Montauk to turn the train and run it West. At that time these trains had mail, baggage and Railway Express. Westbound coming into PD the express men would be standing on the freight house platform with the ramp up ready to drop in the car door as soon as you stopped. This was on the offside for the engineer so we had a mark to stop at. As soon as you stopped you could hear the ramp drop. Once in while you may miss the spot and it would be a few seconds before you here the ramp drop, at that time the old engineer used to say to me, "Not so hot today, right." Another day I was called for a relief engine for the "Scoot". We got the engine in Morris Park and ran light over the Babylon line to Bay Shore where the "Scoot" engine failed. I do not remember what was wrong with it, but we were able to return it to Morris Park. Generally, on a job like this, the faster we got done we got back on the list for the next call. You were paid for eight hours; even if you got done in a few hours. On this day, as we came down off the grade from the Lynbrook station around the curve thru Rockville Center, the track men were working and had the track jacked up. We went sailing thru there and the men were running aside and the jacks went flying. Just a great racket, but we stayed on the track and just keep going. Never heard a word about it.. Probably because we received no orders about the work crew being there and they had not provided any flag protection. As you know when you come to a railroad track a train is due at any time. I do have some old timetables, but do not know if I have the engine numbers for the above incidents. They were both hand fired G-5s. The last steam trip I made was on July 22,1955. I remember it well because my oldest daughter was born the next day. Eastbound was the Steamer and the return trip was a C-Liner that came in on a later train. Complete difference in the ride and operation. I know the last steam train was run quite awhile after that, but as an extra man, I just did not get called for anymore steam runs. Over the years, I ran many steam trips all over the Island. I really liked them on the Montauk and Port Jefferson lines, as there was a challenge to get the train over the road on time. Watching the Kentucky Derby reminded me of the days we carried the famous horses to the three race tracks in the area. This created a lot of work for us plus the race trains that we operated to all three tracks. These were short, LAZY jobs. Lay up at the track during the races and then to New York or Brooklyn so the trains could be used for the homeward rush. Many men lost money on these runs ("Race Track Trains") as they would go to the races. I stayed away. I am not being critical about anyone; just stating a fact. In general, it was the trainmen. They would have cash from fares collected on regular runs and bet with it at the track. Not a sure thing. Monies collected, from fares, had to be turned in within a certain time. Quite often, I would be working a regular train and a trainman would come up to the head end and ask me to stop near his car as he had to make up his losses so he could turn in his cash report. Probably had to play this game until payday when he could catch up. Sometimes, a second man would come up with the same request. Than I had to say, "I am stopping at car markers as required." Sometimes, Conductors would say, "Stop, whenever you want, I do not need any cash." This was not an everyday thing, and in fact maybe should not be mentioned anywhere. I do not know if there is much cash fare collecting on the trains anymore. The Engineer (Mark): I hired out on the Long Island Rail Road in 1941, beginning my railroad career firing G5 4-6-0 and H10 2-8-0 steam locomotives. Shortly afterward, I was firing in Italy , courtesy of Uncle Sam, during World War II. After returning to Long Island when my tour of duty was completed, I was promoted to engineer in 1947. I made a practice of hanging out on the “extra board” in order to maximize the number of hours I worked, as well as to take advantage of the amazing diversity of assignments on this railroad. Midway in my career, I stood for an Extra Board engineer assignment on the Valentine’s Special of February 14, 1963 . This was a shoppers’ special, which entailed two round trips from the Long Island’s hub at Jamaica to the easternmost reach of the LIRR at Montauk. It was a quick way for me to make four days’ pay in 24 hours! The first trip was an early morning “empty equipment move” eastbound over the entire length of the Island to Montauk, where we turned the train and then ran multiple stops from Montauk back westbound to Patchogue, continuing as an express from Patchogue to Jamaica. The passengers we picked up on this trip were shoppers destined for a busy day in Manhattan . At Jamaica , my passengers would transfer cross-platform onto electric multiple-unit motor car equipment for the short run into Penn Station in Manhattan , delivering them into “the city” for a day of wintertime shopping. My second trip, later that same day, was the Valentine’s Special return trip in the evening, bringing those same passengers (and their packages) home after their hectic day on the sidewalks of New York . This evening trip reversed what I’d run that morning: Express from Jamaica out to Patchogue, then all stops from Patchogue to Montauk, turn the train, and finally deadhead back to Jamaica as an “empty equipment move” again. Four trips over the Island in one day! For the evening Special, I drew eight-year-old ALCo RS-3 #1557 and four coaches, including a bar car to keep the passengers occupied and happy en route. As soon as I had platformed my consist at Jamaica to board passengers, up walked my Conductor, veteran Henry Kiefer, with a 14-year-old kid in tow for a visit to the cab. The Kid (Art): Walking to and from school, I often passed a Long Island conductor who was coming home from work or going to work, carrying his grip and lantern, decked out in full uniform. He always had a smile and a pleasant greeting for me – sort of unusual in suburban New York , even then! I must have mentioned this one day to my Dad, who commuted on the LIRR, because I remember Dad telling me that although he was a paying commuter, conductor Kiefer often rode the same train Dad did for free, deadheading into Jamaica for his daily work assignment or deadheading home after work. One evening over dinner, Dad announced that he and Henry had been discussing me and my interest in trains during their ride to the city that day, and Henry had invited Dad and me along for a ride on the Valentine’s Special later that week. Dad would ride in the bar car, and I’d get to ride in the cab of the locomotive – would that be OK? WOULD THAT BE OK?!!! On the appointed day, Dad and I took an electric MU “motor” train from our home in Massapequa to Jamaica , and made our way over to the platform where Henry’s train sat boarding passengers. After quick greetings, Conductor Kiefer walked me up to the cab and introduced me to the engineer and fireman (yep, still had them in 1963). The grown-ups reached quick agreement that the kid would be allowed to stay there and ride in the cab for the entire round trip, 230 miles and six hours time! The Engineer (Mark): As I look back from now to 44 years ago, this cab ride was a lot more meaningful to the Kid than it was to the Engineer! I do remember the trip, but really cannot recall too many specifics this many years later. Apparently, the Kid was impressed with the cab ride and our friendliness during the trip. Good-byes were exchanged after the return to Jamaica in the wee hours of the next morning, and everyone went their separate ways for the next 44 years. The Kid (Art): Although I was certainly a railfan before 1963, that cab ride really ignited an interest in me. After I became established in a “normal” career, I began to volunteer time at a local railroad society and on an operating tourist railroad. During most of my working life, I managed to keep a concurrent “second work life” going in the tourist railroad business. I became qualified as a locomotive engineer on a local tourist railroad in 1979, early in that second career. In 1991, three friends and I established a common carrier shortline railroad, and we were off and running passenger excursion trains, dinner trains and freight service. I often thought of that cab ride back on Long Island , and clearly traced my adult railroad interest and second career back to the ride on the Valentine’s Special that night. Early in 2007, I noticed some comments from a retired LIRR engineer named Mark E. Smith posted on a LIRR fan website. The name matched exactly the signature on the orders which Mark had given me as a memento at the end of the cab ride in 1963, and which I had saved these many years in my pile of LIRR memorabilia. Through the kindness of Steve Lynch and Dave Keller, I obtained Mark’s email address and contacted him. E-mails were exchanged, and two months later, Mark and his wife Marilyn visited me and my wife Debbie in Blissfield , Michigan , where I’m chairman of the board of the shortline railroad company, and a locomotive engineer following in the footsteps of the man who first gave me a cab ride. The Engineer (Mark): Marilyn and I enjoyed a fine dinner aboard the Old Road Dinner Train with Debbie and Art on June 23rd – curiously, the day that would’ve been his father’s 99th birthday! I even got to be the diner who was “killed” during the murder mystery on the train that evening, and they say I hammed it up better than anyone had so far in 17 years of running dinner trains there! When the prime rib was finished, I accepted Art’s offer of a cab ride in the locomotive pulling our dinner train, Adrian & Blissfield RR’s GP-9 #1752. After 31 years of retirement, it felt very good to once again take my place in the engineer’s seat of a passenger train for a few miles! The cab ride privilege which I extended 44 years earlier had been returned in kind, and new friendships made 44 years later. That’s the way it is in the railroad world!